This stage involves the following new components. After taking the Arduino out of the box the first thing to do is to connect it to the breadboard using wires. First, we need to wire up the breadboard's power rails that go up each side. The power rails are designed to give easy access to 0V (also known as GND) and 5V. Using a blue or black wire connect one of the GND pins on the Arduino to the blue rail on the left of the breadboard. Once you've done this the breadboard and Arduino should look like this. Then place an LED from the 5V power rail to the the same line on the central part of the breadboard. Remember: With resistors it doesn't matter which way round you put then, but with LEDs it does. See this page for more information. Now you plug the Arduino into your computer with the USB cable, it should start providing power to the breadboard, lighting up the LED. If the LED doesn't light check that it's the right way round. Having an LED lit is cool, but the Arduino is so much more than just a power source! Let's control the LEDs, first by blinking it on and off once per second. Disconnect the USB cable from your Computer. This removes power so prevents bad things happening whilst you change the connections. Remove the wire joining the LED's positive leg to the 5V power rail. Use a wire (colour such as white or yellow) to connect the LED's positive leg to pin 13 on the Arduino. If you have a brand new Arduino that hasn't been used before the LED should start to blink. This is because it comes from the factory with this test program already installed. // These are called comments and are used to put notes for people inside code. Copy this code into your Arduino software and upload it. Here's your first challenge! Try to complete both tasks. This will help you understand the code. (1) The LED should be flashing once per 2 seconds. Can you make it flash 5 times per second? (2) Can you make the LED flash once for 1 second, then once for 0.2 seconds, then again for 1 second and so on in a dot-dash-dot-dash way? You might already be thinking. How do I know what my program is doing if all the feedback I have is a blinking LED? Well there is a solution in the form of serial communication which allows your Arduino to send messages to a computer. 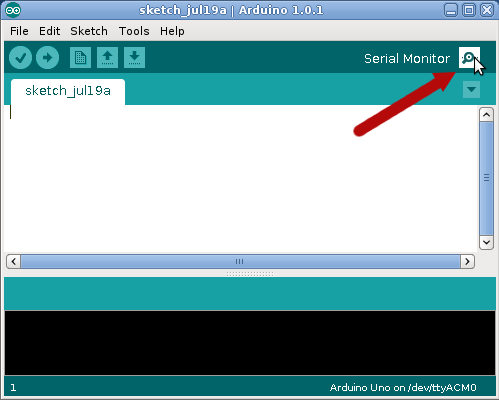 These messages can then be shown on your screen by clicking the button at the top right of the Arduino software. 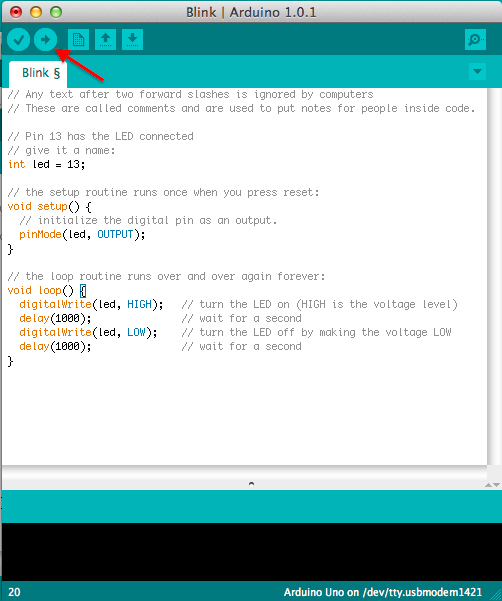 Note: when handling textual information in the Arduino programming language you need to use double quote marks. In this programming language “digitalWrite” represents text (d followed by an i, followed by a g, and so on, spelling the word digitalWrite), whereas digitalWrite (without the double quotes) is a reference to a feature of the programming language which allows you to control the voltage on various pins. You should see the Arduino say “Hello World!” followed by LED On and LED Off once a second. If you are having problems, check that the speed in the Serial Monitor is set to 9600. Otherwise, ask a helper! So that's the end of the 1st lesson. Once the rest of the group has got to this point there will be another short presentation on programming concepts before moving onto Tutorial 2.